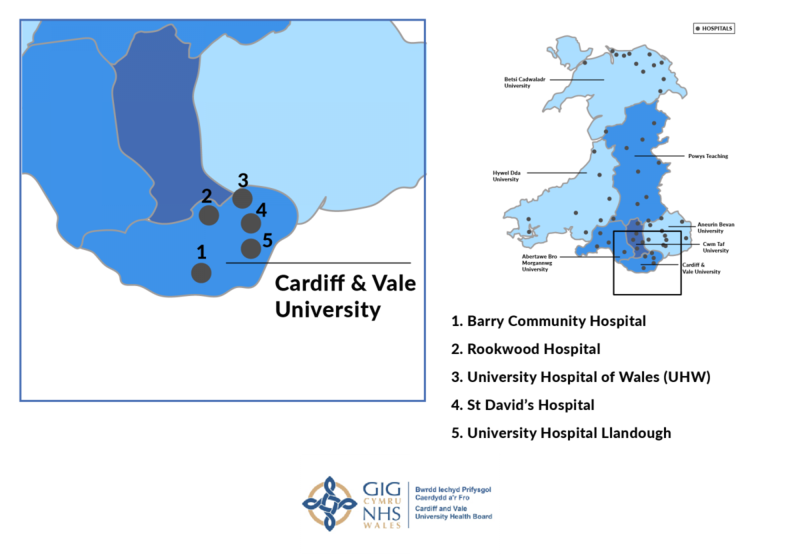 Cardiff and Vale University Health Board provides services to nearly half a million people in the densely populated city of Cardiff and the Vale of Glamorgan, as well as to wider Wales. As a teaching health board and a centre of excellence in many areas, the health board attracts world-class clinicians and is responsible for overseeing medical training at Cardiff University School of Medicine. Barry Community Hospital opened in 1995 to provide Vale of Glamorgan residents with a range of primary and secondary care services. It has a minor injuries unit, outpatient clinics, radiology, rehabilitation wards and mental health services for older people, dental, GP and out of hours services, as well as therapies including physiotherapy and podiatry. Specialisms: The hospital is one of four sites within the health board providing acute and intermediate services for older people. A convalescent home towards the end of the First World War, Rookwood later became a general hospital and is now one of the UK’s spinal injuries rehab centres. It has clinical psychology services and a community brain injuries team, and is also one of three sites across Wales housing the Artificial Limb and Appliance Service. Specialisms: Its neuro rehabilitation unit. A community hospital in Cardiff city centre, St David’s was rebuilt in 2002 after previously being housed in a former workhouse dating back to the 1830s. It provides mental health services, children’s services, dental services, dietetic support and a range of therapies. Specialisms: St David’s has two gerontology wards and a day hospital for older men and women with dementia and mental health issues. Known as ‘The Heath’, due to its location in the Heath area of north Cardiff, UHW is a major hospital serving patients from Cardiff, the Vale and many other local authorities in Wales. It has a trauma clinic, a women’s unit, a stroke rehabilitation centre, a diabetes centre, neurology and neurophysiology, radiology, cardiology, midwife and consultant-led maternity services and a busy A&E. The Cardiff University School of Medicine is based at UHW and has spacious new lecture theatres, modern clinical skills and simulation centres and an inter-professional library. The University Dental Hospital (UDH) is also situated in a stand-alone building on the main UHW site, treating around 100,000 patients every year. Specialisms: UHW is the centre for many specialisms, including cardiothoracic services, critical care, haematology and clinical immunology, the Medical Genetics Directorate, transplant services and neurosciences. Located in Penarth on the outskirts of Cardiff, Llandough Hospital has undergone a major refurbishment to create a specialist rehabilitation and recovery centre, including stroke and neuro and spinal rehabilitation units. The hospital also provides extensive mental health services, midwifery outpatient services, day surgery and and orthopaedics. The site is also the location of Llandough Day Hospital, a centre with 40 daily places for men and women aiming to provide the best holistic multi-disciplinary team rehabilitation service to patients, and houses medical laser removal centre Laserase. Specialisms: Llandough is a specialist centre for rehabilitation and recovery.